Sugar Shockers to Steer Clear Of….How Many Are Fooling You? Most Americans get about 20 teaspoons or about 320 calories per day from added sugars—about twice as much as what’s currently recommended in the new Dietary Guidelines for Americans. The new Guidelines recommend limiting added sugars to less than 10 percent of total calories or about 12 teaspoons per day for a 2,000-calorie reference diet. While the number one source of added sugars in the U.S. diet is sugary beverages like soda, energy drinks, fruit drinks and other sweetened beverages, some 75 percent of processed packaged foods sold in supermarkets also contain added sugars. Here are five shocking sources of sugar that may lurking in your diet. 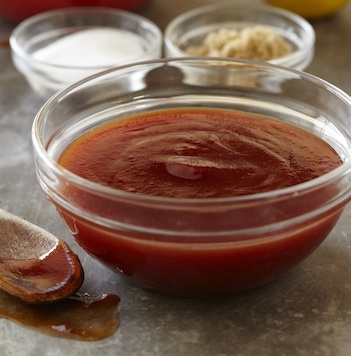 Your favorite barbecue sauce has about 17 grams of sugar per 2 tablespoon serving. That’s equal to 4 ¼ tsp of sugar. Look for a low-sugar alternative or make your own instead. Ketchup has about 8 grams of sugar or 2 tsp per every 2 tablespoon serving. You can also find lower sugar versions of ketchup but read to the labels as some are made with sugar substitutes. If you a.m. wake-me-up more dessert than beverage? 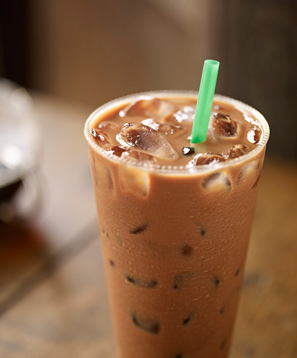 If you enjoy a tall soy latte, you’ll also get 14 grams of sugar 3 ½ tsp) in it. But a tall white chocolate mocha (no whip) packs in some 46-49 grams of sugar or about 12 tsp of added sugars! That’s more than you should have in an entire day. Be sure to check out the nutrition facts of your favorite coffee drinks to make sure you’re not drowning in the sweet stuff. Vitamin Water sounds healthy but a 20 oz. bottle has 120 calories and 32 grams of sugar–that’s 8 teaspoons! Sports drinks may sound like a healthier alternative to soda, but when it comes to providing energy for exercise, the energy source is….sugar! Most sports drinks like Gatorade have more than 20 grams of sugar in a 12 oz. serving. Although yogurt has a health halo due to the calcium, vitamin D, potassium, protein and many other beneficial nutrients it provides, if you eat flavored or a fruit-on-the-bottom variety, it probably has too much sugar. For example, a cup of plain yogurt has about 7 grams of natural milk sugars but a cup of fruit-on-the-bottom yogurt has as much as 32 grams of sugar or 8 teaspoons!. Avoid the flavored options and stick with plain and add your own fruit to sweeten it. Since sweeteners are less expensive of an ingredient than tomatoes, it’s not wonder that many pasta sauces load up on the sugar while they cut back on the amount of real tomatoes in their products. As we always say: “There’s a high price for cheap food.” A half-cup of sauce often has 7 grams or more of added sugars. This is one product that really doesn’t need that much added sugar for it to taste great. Make your own or check the Nutrition Facts panel to find a sauce that’s not diluted with sweeteners. Need more information about sneaky sources of sugar and how to “lick” your sweet tooth once and for all?